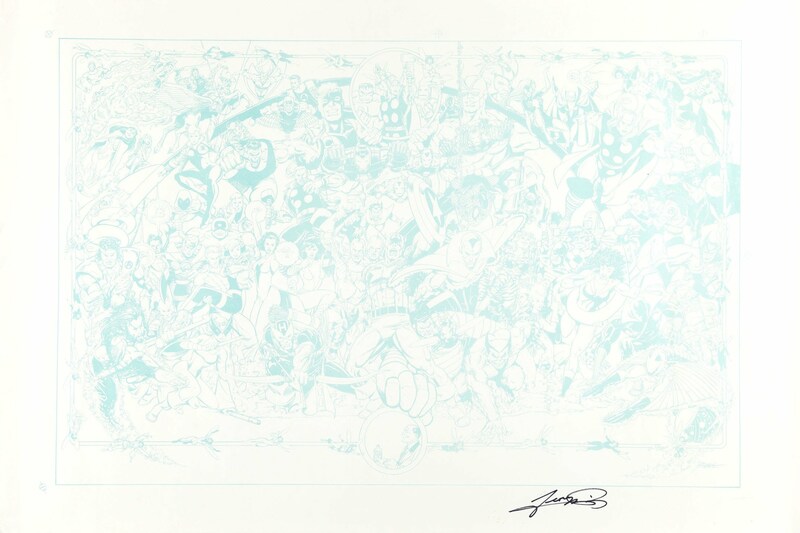 Originally scheduled to feature a cover by George Perez, all covers and stories were pulled at the last minute. Variant cover is now by Stanley Lau. George Perez's original cover will appear on SUPERMAN #714 (Perez cover) (Aug 2011), the last "classic" Superman issue. 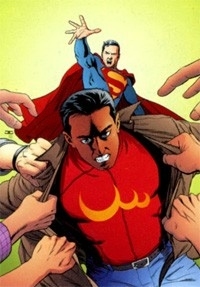 ComicsAlliance: Why Did DC Cancel Superman's Team-Up with a Muslim Hero? At first glance, this might not seem like a big deal, because after all, fill-ins happen all the time. But given that writer Chris Roberson has said that the entire issue has been completed, it seems like there might be a deeper reason that this story got the axe -- and it's hard to believe it doesn't have something to do with the fact that Sharif is a Muslim. Limited 1 for 10 Variant Cover by STANLEY 'ARTGERM' LAU Written by KURT BUSIEK Art by RICK LEONARDI 32 pg, FC Cover price $4.00. Since this book will be on the stands tomorrow, I figure it would be okay to finally show my variant cover for SUPERMAN 712, which I dedicated to the memory of a dear friend named Rob Morrisroe who was a lifelong Superman fan. The original art was given to his surviving life partner Scott Mills. This file is posted for new products scheduled to ship to comic shops on 6/22/2011 which include Creepy Comics Volume 1 TP, Rage #1, Dethklok HC, Action Comics #902, DMZ #66, Fables #106, Cobra #2, Miss Fury HC, All Nighter #1, Darkness Origins Volume 3 TP, Captain America #619, Deadpool #39, Mighty Thor #3, & more. The products on the list below are expected to ship to comic shops on the indicated date. This list, however, is tentative and subject to change. Please check with your retailer for availability, as not all releases may be on sale in all areas the same week. 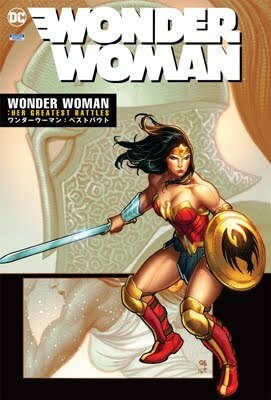 DC Comics has released solicitation information and images for new comics and products shipping in June, 2011. When you're through checking out these solicitations for new releases, be sure to visit CBR's DC Comics forum to discuss these titles and products with fellow readers and fans. The world-changing miniseries continues! Where are the World’s Greatest Super Heroes? Barry Allen is on a mission to find out or die trying – and that may be what’s happening as he tries to make lightning strike twice! Meanwhile, around the submerged Paris, the pirate Deathstroke confronts Emperor Aquaman! Retailers please note: This issue will ship with three covers. Please see the Previews Order Form for FLASH promotional rings. Acclaimed writer Len Wein chronicles the DC Universe’s epic history in this title spanning five generations of heroes, from the dawn of the Mystery Men before World War II through the present day, starring Superman, Batman, Wonder Woman, Green Lantern, The Justice League of America, The Teen Titans and more. Collecting the ten-issue series! For the first time, the stories that introduced Firestorm are collected from issues #1-5 of his 1970s series, plus stories from THE FLASH #289-293. After Ronnie Raymond is tricked into nearly blowing up a nuclear reactor, he and Professor Martin Stein are caught in a nuclear incident. Their personalities merge, forming the being called Firestorm! In 1980, writer Marv Wolfman and artist George Pérez introduced a timeless team including Robin, Kid Flash, Wonder Girl, Cyborg, Changeling, Raven and Starfire – young heroes with great powers and strong personalities who learned their way in the world through the strength of their friendship and the adventures they shared. This first omnibus edition collects the team’s debut in DC COMICS PRESENTS #26, plus the first sixteen issues of their smash-hit monthly series, including the first appearances of foes including Deathstroke and Trigon, as well as a confrontation with The Justice League of America.